Before providing a full set of components and plans for the Photo Booth, I’d recommend breadboarding out a simple version to get you started. If you want to skip that step, then feel free to jump ahead. I am using a 16Gb card, smaller cards will also work fine. A keyboard you can borrow, and connect up to the Pi. If this is new to you, there are plenty of online tutorials that will help you in completing this step. For this reason I won’t bother detailing it further here. The NOOBs install of Raspian (not Raspian Lite) is by far the easiest method for doing this. Using Raspian, the boot time for the Photo Booth is roughly 40 seconds, and (for me) I was content enough with this duration that I haven’t looked too far into alternatives at this stage. If you want the booth to boot faster, then you may want to look at running a more light-weight OS. This is not a topic that I intend to cover right now, but I may cover this later after testing a few different options out. 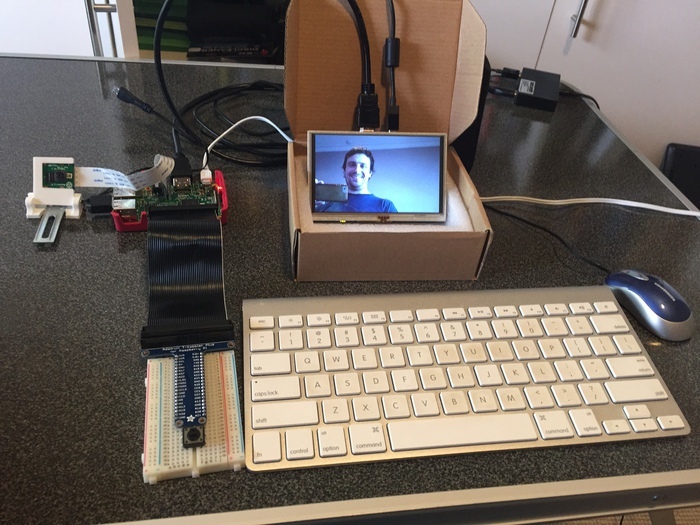 If you haven’t already done so, make sure you’ve got a keyboard and mouse plugged in to your Pi, and that the Pi is hooked up to a screen (which can even be the photo booth’s LCD screen if you like). We are going need to change a number of configuration options, in order to get the most out of out Pi. 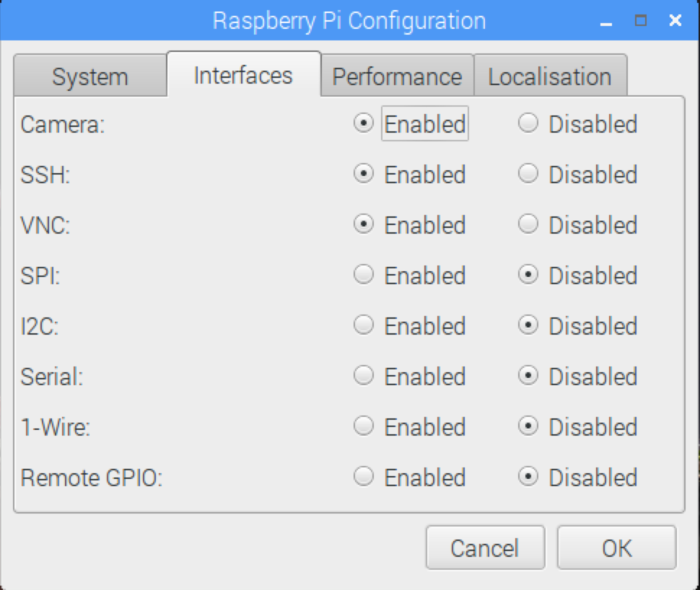 You can do this via the Raspbian application menu, selecting: Preferences > Raspberry Pi Configuration. Alternatively, you can access a similar set of options via the command line (using sudo raspi-config). (Even though “it’s only a Pi”, it’s never a good idea to keep using the default password raspberry). ‘VNC’, which lets you remotely connect to the Pi from another computer (after downloading the RealVNC Viewer client application, onto another computer). ‘SSH’, which allows you to connect remotely to the pi via an SSH terminal. This is an option for advanced users, and not required for this tutorial. By default, your Pi is probably configured to use a UK Keyboard. If your keyboard doesn’t have a pound key (£) on it, then you probably need to switch to a US keyboard (or whichever keyboard is appropriate to you). It’s also worth changing your Locale, Timezone, and WiFi country while here. After saving all of these options, you should restart the Pi to ensure that the changes take effect. If you haven’t already done so, you’ll now want to connect your Pi to WiFi. If you are using Raspbian this is relatively straightforward (just click the wireless networking logo in the top right of the screen, and setup the network). 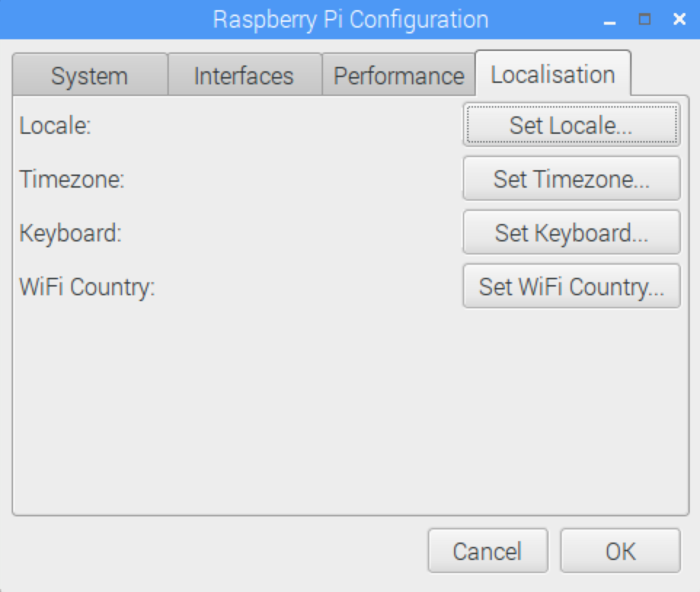 Once you’ve connected up to WiFi, it is also possible to connect to the Pi from another computer via VNC or SSH. We’ll get to this step later on. If you haven’t already done so, connect the Pi to the LCD screen that we will be using as the screen for the Photo Booth. My screen connected to the Pi via an HDMI cable. The screen also requires a separate power source (until I get around to tidying that up). The easiest way to do this is a via a spare USB phone charger and micro-USB cable. When I first connected the screen, the display settings weren’t 100% correct, but we can fix that now. This forces the Pi to use HDMI mode, even if an HDMI cable is not detected. This enables the camera module. This disables the camera LED, which usually comes on when the camera is in use. This allocates us some memory to use the camera. This allows us to use DMT display formats. This allows us to specify custom display settings. To exit the file press CTRL + X; and then specifying Y to save changes. After making these changes, you should reboot the Pi. 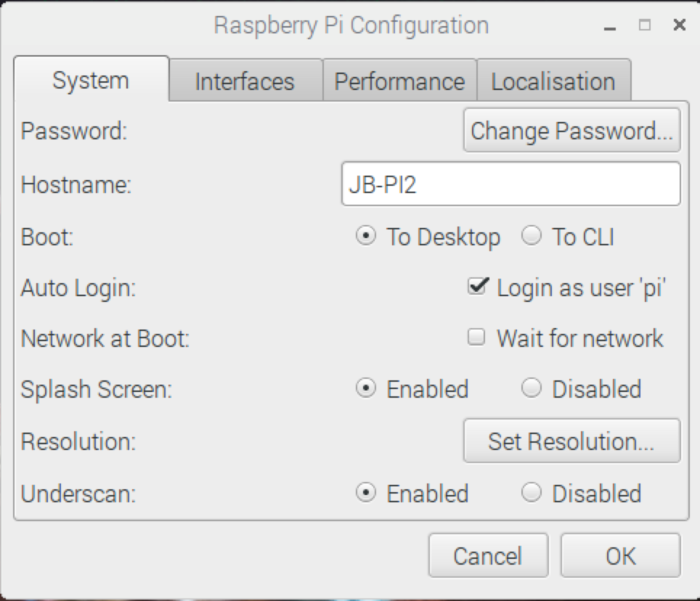 If you’ve made a mistake whilst changing any of these settings, you can boot the Pi in recovery mode (hold the right SHIFT key), and then edit the config file (e). If you’ve gone with a PiCamera per my recommendation then installation is straight-forward (although perhaps a bit fiddly). 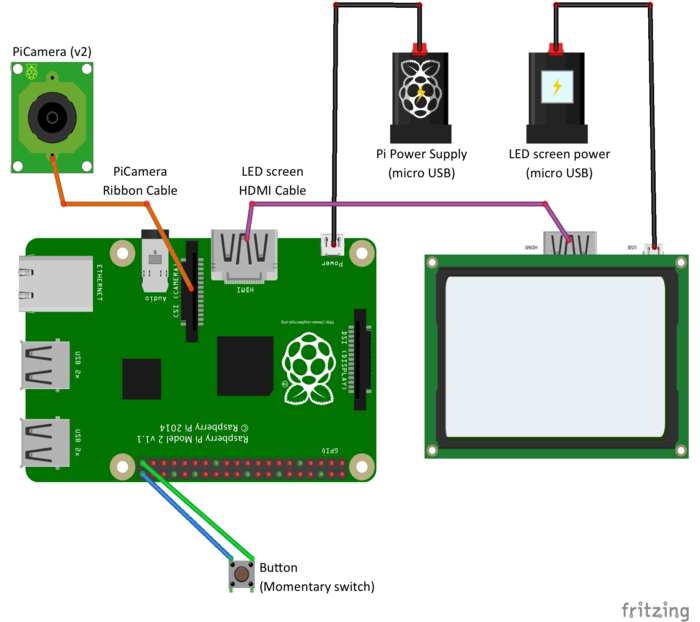 The camera will connect to your Pi via a Ribbon Connector. I’d recommend looking up a YouTube video for how to connect your Pi to the camera. It is different for each version of the Pi, and the latch mechanisms can be a bit fragile if forced in the wrong manner. Because we will be using the LCD screen to display the camera’s output, and we still want to be able to enter commands at the same time, it is best to connect to the Pi from another computer (using VNC Viewer or SSH). The easier option for beginners is using the VNC Viewer. There are instructions to help you do this, here. Once we are connected to the Pi remotely, we can familiarise ourselves with the PyCamera library. Begin by opening Terminal or UXTerm on the Pi. You will be greeted with a command prompt. From here, we can access the python interpreter by typing python. The camera will now be displaying your picture on the screen that is connected to the Pi. (Note, if you ignored my suggestion to connect to the Pi from another computer, you can close the app by typing ctrl + \). You may need to flip and/or rotate the picture, such that it suits the angle your camera has been mounted at. You can now see that the photo has been saved to the Pi. Now that we have a basic understanding of how our PiCamera will work, it is time to connect our button. The button needs to connect to GPIO21 and Ground. Once the button is attached we can safely boot up the Pi again. Once the button is connected we can run a simplified version of our photo booth code. This piece of code doesn’t have the full functionality of my finished photo booth, but it contains “just enough” to test out the functionality that we care about and get an idea of how the finished code might look. Boot up your Raspberry Pi again. Press the button to test the code. To exit the simple photo booth app, press ctrl + c.
For the next article in this series, I’ll be talking about building the wood cabinet that houses the photo booth. If you’d prefer to skip that step, you can jump ahead to Part 5, where we extend our “simple photo booth” code into a Fully-featured Photo Booth app.